Cetacean, the collective noun for our three types of marine mammal species. The word does little to explain and illustrate the excitement that a sighting of these species produces amongst the passengers on a boat or the walkers on a lonely cliff top. If we saw these extraordinary creatures every day of the week it would still not be enough. Their obvious intelligence, their continuing relationship with man and emphatic enjoyment of the presence of man in their midst does everything to endear them to us. We hear reports of sick people being quickly identified by dolphin and those individuals finding benefits having spent time in the water in close proximity to them, people with depression have felt elevated and recharged with a sense of optimism. The male dolphin clearly recognises the female of homo sapiens. There have been many verified reports from people lost at sea, maybe victims of a wartime torpedo who have found themselves being defended by pods of dolphin against the dangers of shark attack. All of these idiosyncrasies building into a reputation for man’s best aquatic friend. Small wonder we experience such excitement when seeing them. Size and agility, two elements of the cetacean which both overawe the spectator. I recall my own first sighting of a Finn Back whale not too far from the shore line. In fact it wasn’t exactly my first as my partner was the one to see the whale when it broached some half mile from where we were in the boat. Unfortunately it did so over my shoulder and all I was left with was a pointed finger and a wide open mouth having heard the words “did you see that?” Well actually I hadn’t and I couldn’t believe my one opportunity to view one of these magnificent creatures had by shear bad luck avoided me. However all was not lost, within half a hour we were being escorted by five whales, three on one side of the boat, two on the other, viewing us through their giant eyes as much as we viewed them. Who was the spectator now? 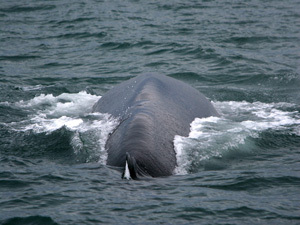 Their size was astonishing, three times the length of the boat we were in and only a matter of a few feet from our sides. It made one feel so completely vulnerable and yet at no time was there any reason for disquiet, any show of aggression, any indication of insecurity or cautionary behaviour from the whales, just a sense of curiosity and calm. A short while later we watched them lie in a semi circle on one side of an islet while a member of their pod manoeuvred themselves into position on the other side. The Finn Back then up-ended itself and proceeded to beat the surface with its tail fluke. The shock waves of sound being used to drive the shrimp and prawn away from the islet and to the waiting ‘diners’. 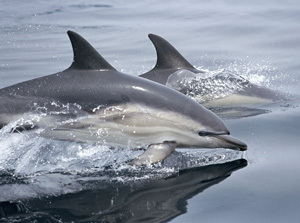 The pod of dolphin were crossing a sound between two islands off the Connemara coast. My own boat was steaming into this sound with the intention of the passengers catching some fish in sheltered waters. “Dolphin!” The shouted word galvanised those who had yet to spot the display of a transient or feeding group a short way off our bow. As we drew near so the pod turned and I started a head count which arrived at a figure of 30 plus. They use the wake of the boat as a wave to surf down and will ride the bow wave of a boat just under the surface being pushed along by the displacement of water. Their dorsal fins cut the surface and the coloured flanks and figure of eight pattern give a clue to their species which was Common Dolphin. We prescribed a slow circle in the sound and the dolphin stayed with us so by way of experiment I stopped the boat and turned off the engine. The silence was wonderful and off our starboard side remained the dolphin, five visible on the surface, the others rising falling as they surfaced for their breath of air. The five dolphin on the surface then as one turned and at some considerable speed charged the boat. I say charged and truly mean it. On the surface, straight at the side of the boat from fifty yards away. At the last moment they swept under the hull and resurfaced on the port side. Out fifty yards, slowing and turning, a brief moment and then charged the boat again. The same result, at the last moment sweeping under the boat and remerging the other side. Twice more and then they departed, the final pass being accompanied by one of their number leaping into the air and splashing down close enough to the boat to spray some of us with seawater. Sufficient to say this does not happen everyday we are at sea, I wish that were the case but with the new Brazen Hussy we will be carrying hydrophones which in due course will better enable us to find these wonderful mammals and to share with you the sounds of whales ‘singing’, dolphin and porpoise ‘clicking’ while they are out of sight below the waves. We will, on selective occasions, be travelling out to the edge of the Continental Shelf where from late summer to autumn can be found the largest of the world’s whale species, the Finn Back and the Blue whale. There are other species of whales in Irish waters, the most common hereabouts being the Minke whale and there being a total here of 17 different species of whale and 6 of dolphin with just 1 of porpoise. 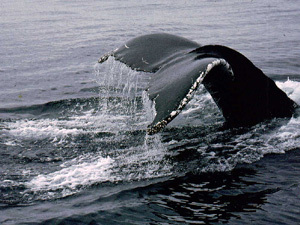 The possibility of an increase of whales into our waters is a continuing subject for debate. The changing climate, water temperatures, levels or quantities of suitable food, make our cetacean species appearance somewhat changeable and at this moment there is a suggestion that we may enjoy an increasing level of these magnificent creatures to our part of the world. Never-the-less, there is one absolute certainty that if and when they appear, when the feather of a whale breathing appears over the waves, the level of excitement among the spectators will become absolutely ‘electric’.